What: Indie-pop outfit founded in Oakland a decade ago and anchored by drummer Pat Spurgeon and singer/guitarist/namesake Zach Rogue, because “Schwartz Wave” would have been a pretty bad band name. Why: They released their fifth full-length Nightingale Floors at the start of June, and are now on tour to support it. Who else: Brooklyn’s Caveman opens up. How: Tickets for the show are $19.50 in advance but courtesy of LiveNation, I’ve got two pairs of passes to give away for the show. To enter, email me at contests AT chromewaves.net with “I want to see Rogue Wave” in the subject line and your full name in the body. Contest closes at midnight, June 23. What else: MTV Hive and Metro have feature pieces on the band. Frank YangObjectively speaking, there’s not a world of difference between Widowspeak’s 2011 self-titled debut or the follow-up Almanac, released in January of this year. You can file them both quite comfortably under “the soundtrack to dreams of dusty country roads”, not too far from lazy but not inaccurate reference points Mazzy Star and Cat Power, but something about Almanac grabs me the way that Widowspeak, as much as I dug it, didn’t. And it’s not something as simple as they’re getting more dynamic or rocking out harder, as refresher listens to their debut confirm there’s no shortage of volume spikes amidst the sleepiness. There’s just something more present, more assured, in Almanac‘s grooves – like lucid dreaming versus wake-walking. Whatever it is, I love it, and so their show at The Garrison on Monday night – their first non-festival headline date in Toronto – was a must-go on my calendar. Local support came from The Auras, signed to Toronto’s Optical Sounds and labelmates with B-17, whom I’d just seen just a few days earlier; if there’s some sort of shadow conspiracy to get me more attuned with the city’s psych-pop scene… then it’s working. Mind you, The Auras didn’t impress the same way that B-17 did, but they’re not really built to. Comprised of fresh-faced youngsters rather than scene veterans, they were a bit of a mish-mash visually – a mass of paisley, headbands, shaggy hair, tassels, and with half the six-piece band in sunglasses, all bathed in their a bring-your-own light show. Sonically, they felt more like a a psychedelic jam session, rotating through four lead vocalists and possessing more of vague mandate to sound like a more shambolic, polite Black Angels than a firm mission statement. Understand that this is not a complaint, but actually more a point of envy. Having a group of like-minded players to jam, gig, and record with sounds like the best thing ever, actually. 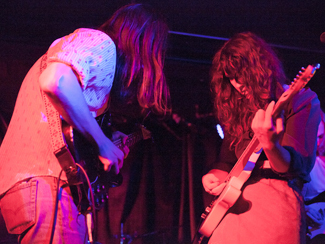 I saw Widowspeak twice last year – in the same room at NXNE and a few months earlier at SXSW – but this time there was a new rhythm section in place and a fifth member in the fold on guitar and keys. The heart of the band, however – Molly Hamilton and Robert Earl Thomas – were still there, ever front and centre. Opening with Almanac leadoff “Perennials”, the template for the show was quickly established – Hamilton serenely cooing into the mic while Thomas got to play the role of guitar hero, although he would have been more effective at it had his guitar not been the quietest of the three on stage; a little more volume would have helped his leads achieve the prominence they deserved and might also have quieted the reasonably-sized if disproportionately chatty crowd audience. As the show progressed, the chatter either diminished or the genuinely interested moved up to the front – in either case, they were drawn in by the performance, which maintained the same basic rhythm through the better part of an hour, offering a good mix of Almanac and Widowspeak material though sadly omitting two of my favourite new songs, “Devil Knows” and “Spirit Is Willing”. They did shift gears slightly towards the end with a cover of Chris Isaak’s “Wicked Game” – yeah, having Hamilton wrap her voice around it is a bit on the nose, but still gorgeous – and a keyboard-led “Thick As Thieves”, before closing with a relatively raucous “Ballad Of The Golden Hour” and “Harsh Realm”. An encore wasn’t a foregone conclusion, but Hamilton was enticed to come back out for a final number, a reading of “Limbs” done solo because the rest of the band didn’t know how to play it, and were also busy selling merch off to the side. A modest finale to a modest yet wholly enjoyable show. Iamnosuperman and Good Times have interviews with Robert Earl Thomas and The Riverfront Times chats with Molly Hamilton while El Paso What’s Up talks to both. Not necessarily enough show announcements this week to devote a post, but still a few things of note. Seattle’s Cave Singers will bring their new album Naomi – released last month – to town for a show at The Horseshoe on June 17, tickets $15. There’s a feature on the band at 85-26. 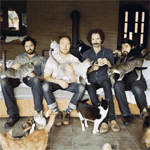 California’s Rogue Wave are back with a new record in Nightingale Floors coming out on June 4, and are teaming up with Brooklyn’s Caveman, who just released their second self-titled album, for a Summer tour that hits The Mod Club on June 25, tickets $18.50/. Another bi-coastal bill will team Californian psych-pop outfit Woods, still working last Fall’s Bend Beyond, with New York ’90s indie rock revivalists Parquet Courts and their debut Light Up Gold for a date at The Horseshoe on July 17, tickets $15.50. Los Angeles’ Julia Holter brings last year’s Ekstasis to The Drake on July 17, tickets $16.50. Consequence Of Sound, Spinner, Vulture, and Spin talk to Thermals frontman Hutch Harris and PopMatters to drummer Westin Glass about their just-released new record Desperate Ground, and they also talk to The AV Club and Clash respectively about action movies. The Thermals are at The Horseshoe on May 21. MTV Hive and Stereogum have features on The Yeah Yeah Yeahs, whose new record Mosquito arrived this week. Interview and The Victoria Times-Colonist talk to Sam Beam about the new Iron & Wine album Ghost On Ghost. PopMatters, eMusic, Forbes, and Spin have features on The Flaming Lips and their new album The Terror. The National Post talks to Steve Earle about his latest The Low Highway. Ra Ra Riot is streaming the single they’ll be releasing for Record Store Day this Saturday via T Magazine. The Alternate Side also has a session with the band, who are here on May 25 at The Sound Academy supporting The Shins, then back for the Field Trip fest at Garrison Commons on June 8. Stereogum has a stream of The Hold Steady’s contribution to this week’s Game Of Thrones closing credits, while Wired examines the intersection of the kingdoms of Westeros and the world of indie rock. The Hold Steady are here as part of the Toronto Urban Roots Fest on July 6 at Garrison Commons. NPR has a Tiny Desk Concert concert with Yo La Tengo, one of the names at the final day of the Toronto Urban Roots Fest at Garrison Commons on July 7. Kurt Vile is also playing TURF Sunday; Noisey has an interview with him about being a rocker parent rocker. Janelle Monáe dishes a bit to Billboard about her long-awaited second album The Electric Lady, due out later this year. Stereogum have premiered the new video from Low’s The Invisible Way. Okkervil River’s Will Sheff has squeezed another video out of his Lovestreams side-project. NPR welcomes Local Natives for a World Cafe session. What: Rangy Californian power-pop merchants and dusty Texan folk-rock throwbacks team up for a bill that’s all about value. How: Tickets are $19.50 in advance but courtesy of Collective Concerts, I’ve got five pairs of passes to give away for the show. To enter, email me at contests AT chromewaves.net with “I want to see a Rogue Wave on the Midlake” in the subject line and your full name in the body. Contest closes at midnight, September 21. What else: Revue interviews Tim Smith of Midlake, who just rolled out a new video over at Stereogum. J J BullockHave we officially christened a “song of the Summer” for 2010 yet? Do we even have enough of a monoculture anymore that a consensus on such a thing is even possible? If so – or if not – I would like to nominate “Zorbing”, the lead track and single from Beachcomber’s Windowsill, the debut album from Oxford, England’s Stornoway. It’s a simple but instantly catchy tune about the metaphorical joys of rolling around London in a giant hamster ball – I think – that’s elevated from good to great with a couple of key flourishes: the low “whoaaa” harmonies in the chorus and the jubilant horns in the bridge that hearken to Belle & Sebastian’s finest moments. And said Scots aren’t a bad reference point for Stornoway in general, at least as far as articulating the aesthetic of their orchestrally-appointed folk-pop. But while they’re clearly capable of wide-eyed upbeatness, as “Zorbing” and the follow-up single “I Saw You Blink” clearly evidence, Stornoway’s hearts are inherently heavier and Brian Briggs’ vocals more inclined to drama – so maybe it’s to their benefit that Briggs doesn’t seem to have much luck in love; it makes for great lyrical fodder. His bandmates back him up with all the standard pop band accouterments, but close listening shows there’s a lot of detail hidden in the nooks and crannies of their seemingly austere sound – pianos, kazoos, strings, Morse code, church bells… and it’s these touches, like those aforementioned little details in “Zorbing”, that elevate Stornoway above the pack. If your Summer consists of getting your heart broken or wishing you were getting your heart broken whilst lounging on grassy hills (and maybe watching people roll down said hills in giant plastic balls) then Stornoway should be, if not your soundtrack, then at least in your playlist. Drowned In Sound has a feature interview with the band. Beachcomber’s Windowsill is out in the UK right now and digitally in North America. It will be out in physical form on this continent on August 10. So far their American itinerary has consisted of an expeditionary gig in New York earlier this month, but promises are being made of a full incursion this Fall. Update: The album is now up to stream at Spinner. Shonen Knife have a date at the Horseshoe on October 1, tickets $15.50. Their new album Free Time will be out on August 31. Justin Townes Earle will follow up the September 14 release of his new record Harlem River Blues with a Fall tour that includes an October 15 date at the Horseshoe. Jessica Lea Mayfield supports. Sharon Van Etten records a Takeaway Show for Le Blogotheque. Her new record Epic is released on October 5. Daytrotter has served up a session with Rogue Wave. They’re at the Opera House on September 24. Billboard talks to Dean & Britta about the release tomorrow of their 13 Most Beautiful soundtrack album which is out tomorrow. Spinner talks to Ra Ra Riot about the making of their new record The Orchard, out August 24. They’ll be at the Molson Amphitheatre on August 28 supporting Tegan & Sara and City & Colour. The Omaha World-Herald talks to Spoon bassist Rob Pope. Lazy-i interviews Jim Wilbur of Superchunk. Their new record Majesty Shredding is out on September 14. Las Vegas Weekly tries to squeeze more information about Matador 21, going down October 1 to 3 at the Palms in Las Vegas, out of label head Gerard Cosloy.